Colorful, funky, and a ton of fun, this tie-dyed rainbow bagel recipe is perfect for beginners. Even if you've never made a normal bagel, you can make these! This easy recipe is based off a Jewish bagel recipe, offering an authentic taste in a pretty package. Rainbow bagels add a splash of color to your bagel snack, breakfast, or brunch. The original rainbow bagels draw big crowds at Brooklyn's The Bagel Store where they were created. For the average home baker, recreating these neon delights can be a challenge. Most rainbow bagel recipes add food coloring to individual balls of dough. The trick is to make sure the colors are even and that everything rises at the same rate. The colorful layers don't always stay together while baking and, if you have a smaller kitchen, all the bowls of dough can quickly overwhelm your space. 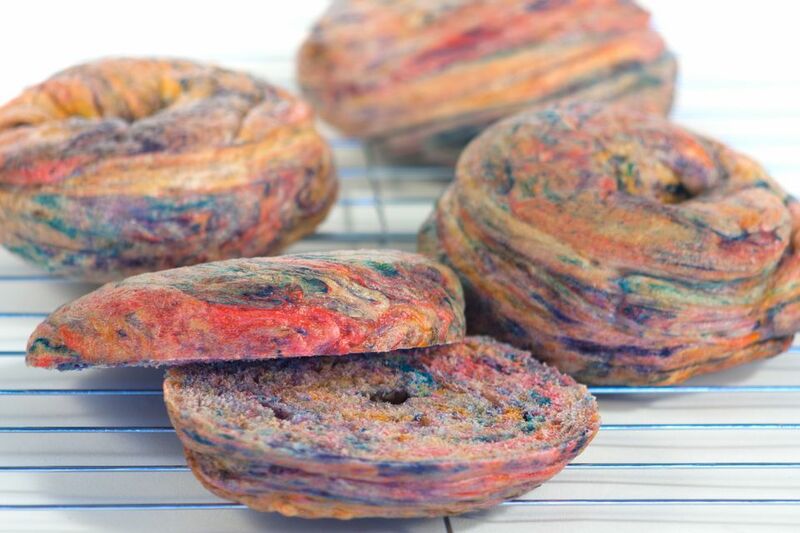 These tie-dyed rainbow bagels fix all that. You'll work with a single ball of dough and add colors while you knead. It's super easy—no different than a basic bread recipe—and a fun art project in the kitchen. You can choose any combination of colors and make them as vibrant as you like. With this technique, four colors seem to work best, though you could use up to six. Be sure to use gel food colorings and not the liquid variety. The gels provide more vibrant colors, cover the dough better, and do not stain as badly. There is potential that your kneading surface will get stained, so it's best to avoid wood or any porous surface. You can wear food-safe gloves if you like, but the gel colors clean off your hands pretty easily, especially if you hand-wash your dishes afterward. In a large bowl, stir the yeast and sugar into the lukewarm water. Set aside for 10 minutes until the yeast activates and the top becomes foamy. Stir in 2 cups of the flour along with the salt. Add 2 more cups of flour and stir until the dough begins to form a ball and is solid enough to knead by hand. Turn the dough out onto a lightly floured surface that you don't mind getting food coloring on—a baking sheet works well. Knead the dough by hand for 5 minutes. The rest of the kneading process will take about 15 minutes during which you'll add food coloring as well as any additional flour needed (1 tablespoon at a time). Begin with three drops of the lightest color. Fold the wet gel into the center of the ball and continue kneading, pulling, and folding the dough to distribute the color. After a couple minutes, add three drops of the next color to an uncolored part of the dough ball and repeat the process. Continue adding the food coloring, alternating colors, until all of the gluten strands are colored. The colors will mix slightly, but you will still have bold streaks of color, giving it a marbled look. Stop before the colors become muddy and when the dough is elastic, smooth, and soft. Form the dough into a ball. Place the ball in a lightly greased bowl and flip it over so both sides are greased. Cover with a clean towel and let rise in a warm place for 30 minutes. Punch down the dough. Turn it out onto a lightly floured bread board (the dyes should not stain wood at this point) and knead for 2 minutes until it becomes elastic again. Form the dough into a mound and divide it into eight or 12 equal pieces using a sharp knife. Work with one piece of dough at a time to form individual bagels. For each bagel, form a small ball. Roll this under the palm of your hand until it forms a thick rope that's about 4 to 6 inches long. Stretching the dough rope, wrap it around your hand—just below the fingers and above the thumb—and gently press the two ends together. If it doesn't stick, dip your finger in water and dampen the seam. With the dough still around your hand, gently roll the joint you just made against your board. You don't want it to be flat, but do want to make the seam disappear for the most part. Place the shaped bagel onto a lightly floured pan and adjust the shape if needed. Make the hole big because it shrinks as the bagels rise and bake. Continue forming the rest of the bagels. Once done, cover the bagels with a towel and let them rest for 25 minutes. Preheat the oven to 375 F. Fill a large pan with at least 2 inches of water and add 1 tablespoon honey. Bring it to a boil. When the bagels are done rising, lower the boiling water to a simmer. Carefully place three or four bagels in the water at a time. They should float and not touch each other. Simmer for 1 minute, then flip each bagel over and simmer for one minute longer. Using a slotted spoon, remove the bagels and set them on a lint-free towel to drain. Continue simmering the bagels until all are done. Place the bagels on a baking sheet lined with parchment or lightly greased with cooking spray. Bake in the oven for 25 to 30 minutes, until crispy, rotating the pan halfway through. Remove the pan from the oven and set the bagels on a wire rack to cool. The bagels will keep at room temperature for 2 to 3 days in an airtight container and can be frozen in plastic wrap and a freezer bag for 2 weeks. Save Yourself From Crusty Bread Dough, Grease It! What's the Difference Between Batter and Dough?